1. To begin creating your perfect pineapple candles, first use a drop of hot glue to attach the candle wicks to the center of the bottom of your jar. 2. Next, in the candle pitcher, over medium-low heat, melt four cups of soy flakes. Make sure to stir frequently. 3. Add 3 blocks of yellow wax colorant along with 20-30 drops of pineapple fragrance oil and mix well. 4. Carefully pour the hot wax into your jars and allow to sit undisturbed until cool. 5. While candles are cooling, paint the lids of the jars green. Cut “leaves” from your green felt to create a crown atop the jar lid using hot glue to affix the pieces. 6. 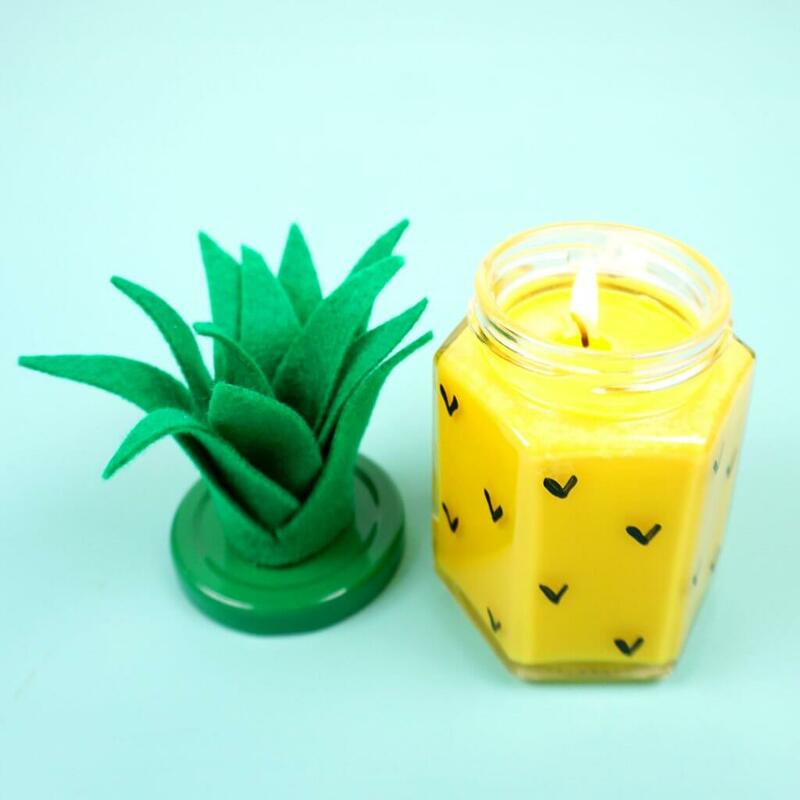 Attach jar lids to bottoms to create your perfect pineapple candle! 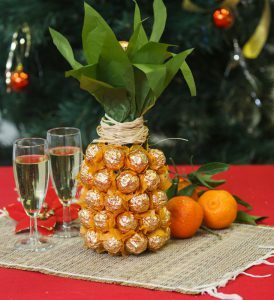 Pineapple, Chocolate, and Champagne, Oh my! 1. Start of creating this luxurious housewarming gift by cutting the orange tissue paper into 7×7 cm squares. Next, apply hot glue on the flat side of each chocolate and glue to the center of a square of paper. 2. Next, fold the edges of the paper to the top of the candy and apply glue to the flat side again and stick to the bottle. Begin from the bottom of the bottle and work in a circle, gluing the candy tightly together so that there aren’t any visible gaps. 3. Cut long narrow leaves from the green tissue paper and glue them together, creating layers. Paste these layers over the neck of the wine bottle in a circle. 4. Affix your ribbon to the bottle for some extra flair. Now impress your host with this creative presentation! 1. Begin creating this tropical treat by making the crust. In a large bowl, combine graham cracker crumbs with butter and stir until combined. 2. Make a pineapple layer by placing pineapple a medium saucepan over medium-low heat. Cook until thick and jammy, approximately 15 minutes. 3. While pineapple is cooking, create your cream layer in a stand mixer fitted with a paddle attachment. Beat the heavy cream until stiff peaks form and fold in cream cheese and sugar. For best results, use a piping bag for this mixture. 4. 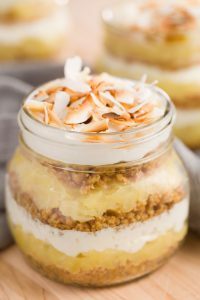 In four mason jars, layer graham cracker crust, pineapple and cream, alternating until the jar is filled. 5. Garnish with toasted coconut and enjoy! 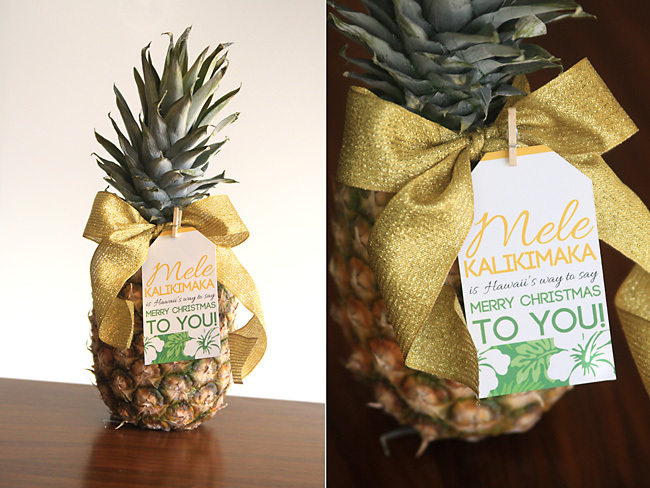 For the grand finale, we give you the most simple pineapple gift of all: the perfect pineapple! Being that the pineapple is an international symbol of hospitality, make your hosts feel your appreciation for their generosity by giving a pineapple to be proudly displayed. Affix these adorable gift tags to wish your host a Mele Kalikimaka Christmas to bring some tropical flair to the holiday! Need Some Inspiration for Your Holiday Cooking? Check out our Best Fall Recipes Here! This entry was posted in Recipes, Tips & Tall Tales and tagged chestnut hill farms, costa rica, holiday, perfect pineapple, pineapple, pineapple recipes, recipe. Bookmark the permalink.